Well, when you run a blog about libraries and museums you kinda have ask yourself these questions. Then you get to find where the destination of answer leads. That is something that I have always loved about research be it online or the olde fashioned way. Half of my time spent is often reading everything save that for what I am actually looking. Then where and when of that answer is The Charleston Museum in South Carolina. It was established way back in 1773 while the state was still a British colony. 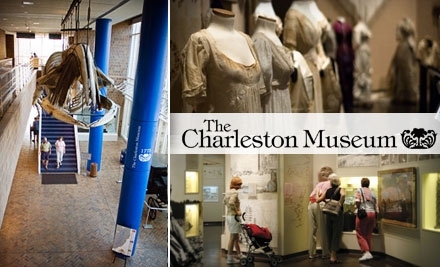 The museum was founded by the Charleston Library Society. The mission statement of the museum was and still is, "To document and explain the natural and cultural history of Charleston and the South Carolina coastal region through the maintenance, improvement and expansion of collections documenting the natural forms and material culture of this region." It was modeled after the British Museum which was created by an act of Parliament in 1753 (only 20 years earlier). An interesting note while I was looking into the history of Charleston. The city for about 50 years had the only system of American aristocratic nobility base on plantation land acreages (A landgrave was the equivalent of a duke. A cacique was an earl. Barons made up the lower rung.) The things you learn here. The museum itself has an eclectic base of exhibits and is fully modernized and functioning today. It has been running fairly consistently since its creation except for a few bumps in the road like the The Revolution and The Civil War. Like many other long lived organizations the original building was destroyed, but the efforts of those who wished to see the museum succeed preserved it and it is still around today. Those exhibits include archival materials, Charleston history, antique firearms, Egyptian artifacts, ornithology and "Lowcountry Textiles, including costumes, quilts, and needlework". It really has a wide range of appeal so it would make a nice family destination. The museum is beginning to digitize some of the archive material. It can be accessed at The Lowcountry Digital Library along with other Charleston places of interest such as The Citadel, The Gibbs Museum of Art and The Diocese of Charleston. Here is the link the museum. Here is an awesome page on Charleston history.